Two years out of beta, how does Google's online office suite hold up? Since Google Docs officially went out of beta on July 7, 2009, the Web-based office application suite has steadily gone through a series of changes and tweaks. Google has a tendency to add new things to their online apps under the radar, not really hyping them -- unless you are in the habit of checking the Google Docs blog. And it seems as though things are quietly ramping up. That's not surprising, considering the limited launch of Google+, the company's new social networking site, which looks like it's on the way to be heavily associated with Google's other online apps. I have used Google Docs regularly in my everyday work for nearly two years. In fact, I now use it to write all of my assignments (including the words you are reading now) and maintain a few spreadsheets. I don't remember when I last touched an application from desktop office suite such as Microsoft Office or OpenOffice.org. With that in mind, I've taken a look at Google Docs, with a view toward investigating some of the new features, considering how useful they are and looking at what could use improvement. Google Docs is a suite of five Web-based office applications: Document (word processor), Drawing (line drawing editor), Presentation (slide-show maker), Spreadsheet (a spreadsheet program, of course), and Form (a very simple polling app). Any document or drawing you create with these applications (or convert to the Docs format) is stored on Google's servers under your Google user account; according to the Google Docs Help page, there are no limits to how many documents you can work on within Google Docs itself (although there are some file size limits). You can also store up to 1GB of unconverted files free of charge. Interestingly, you can actually upload files that are sized up to 10GB -- there are several storage plans that let you buy more space. There's one fact to keep in mind: Everything related to Google Docs runs online. Throughout my use of Google's Web office suite, I've found that the reliability of my Internet connection is the most important factor -- for example, Document may freeze if your connection suddenly drops. Fortunately, Google Docs continually and automatically saves your files, so it's unlikely that you'll lose any work if something does go wrong. Google used to provide offline functionality through Google Gears, but it removed that feature in May 2010, saying it did so because it was going to work toward an improved version of this functionality using HTML5, although it hasn't been announced when that will happen. The essential code for the applications would be stored locally in your Web browser and updated the next time your computer goes online. The Home screen is the starting point for Google Docs. The documents and drawings you create with its various applications, and the files you upload for storage, are listed here. The Home screen is the starting point for Google Docs. This central command for your documents and media is laid out in three columns. The middle column lists your documents and media files. Click on a document name, and Google Docs launches a new browser tab and opens the file. You can also view unconverted image files that you've stored in your Google Docs account: Just click its file name and a viewer window pops open. You can also watch video clips that you've uploaded. The left column lets you filter your files by whether you have starred them (which marks them as higher priority over others) or by ownership (which is determined based on who originally created a file -- you or someone else). You can also access those you have placed in the trash. This column also lists your "collections." 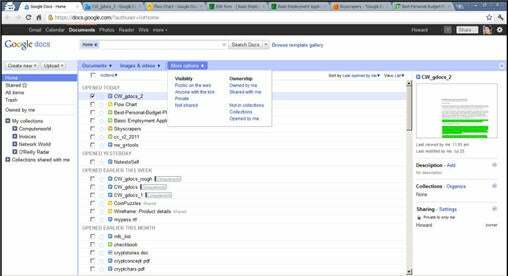 A collection is Google Doc's term for a folder into which you put files you have selected to be grouped together. For instance, you can put all your invoice-related documents and spreadsheets into a collection you have named "Invoice." You can also create collections within collections -- so that within the Invoice collection you can have another named, say, "Paid." To create a new collection, simply click on the "Create new" button and name it. You can then check off the files you want to put into this collection, and click on the Organize link in the right column. (When you click "Organize," it would be convenient if you could also create a new collection within this window and not have to go back to the left column to do this.) You can also simply drag and drop file names from the middle column onto the collection name in the left. The right column shows a thumbnail of a document, image or video clip you've selected in the middle column. Details about the file are listed below the thumbnail, including a description (that you can add to and/or edit), which collection it belongs to, its revision history and its sharing settings.